A Sou th Coast farmer has developed a simple way of bringing the benefits of natural omega 3 rich meat directly to consumers. The example of Warren Salway, of Sollys Bulk Meats, is featured in a newly published book, ‘Why didn’t my Grandmother get fat? … and why did I?’ by Australian journalist, David Mason-Jones. Omega 3 fatty acids are one of the beneficial substances contained in animal products that have been farmed by grazing on pasture all their lives. He reasoned that this would be a simple way for a farmer to make direct contact with food consumers and it would be a simple way for food consumers to make contact with a farmer. A classified advertisement may not be the most sophisticated marketing tool, but it works. This is probably the simplest way for a farmer to test the market to find out if there’s anyone out there who wants to buy meat directly from the farm. Responding to such an Ad is probably the simplest way for a food consumer to reconnect with a farmer. Warren and his family are 5th generation farmers at a property west of Cobargo in the beautiful Wandella Valley on the South Coast of New South Wales. His Ad is very simple – just a few centimetres in the Classified section and he confines this advertising to local newspapers in a relatively tight marketing zone around his farm. He covers Canberra, Wollongong and the South Coast towns. Once a purchase is made, Warren has the animal slaughtered through a legally approved abattoir and has it cut into quarters by a professional butcher in Cobargo. The bulk meat is then delivered by Warren direct to the customer by a refrigerated meat delivery van. The meat is cut up into bulk packs as directed by the customer. The case of Warren’s meat supply chain (Solly’s Bulk Meatswww.bulkmeat.com.au ) is a case where there is only one degree of separation between the farmer and the food consumer. This type of arrangement is definitely not a mass marketing arrangement but it works on a small scale and in a small area. Warren sells very few of his cattle through the saleyards any more – only the old ones and the ones he thinks might not meet his standards of taste and tenderness for his customers. 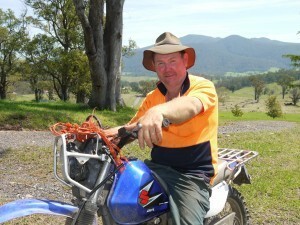 His direct marketing operation has become the mainline of income from his farm. There are great benefits in this for both the customer and myself. The customer has a guarantee of grass finished meat, knows the farmer that produced the meat and knows exactly the farm where the meat came from. ‘As farmers, my wife and I, and our family, are receiving tangible benefits from establishing direct links with food consumers. Just over four years ago I was appalled one day at the price I was offered for my vealer calves in the normal saleyard. I simply decided that things had to change and that I would start selling the beef and lamb myself. ‘Annually, we now sell around 250 carcases of beef and around 180 carcases of Dorper lamb. Our financial status has improved considerably. A bonus in this whole arrangement which I had not expected when we started is that we have met a lot of great people. In fact, we have recently renovated a mud brick house on our property as farm stay accommodation. ‘We have made it clear to our customers that they are welcome to come and stay at the farm and see exactly how their beef and lamb is raised. Early indications are that we are going to have a lot of takers for our farm stay offer,’ he says. The case study of Solly’s Bulk Meat may be the simplest and least sophisticated way of getting connected – but it works! For Warren, his method of marketing by placing a Classified Ad avoids the need for him to go to the farmers’ market and get bogged down in the detail and time consuming process of personally selling at markets.